The part about a translated work that irks the most is that it is translated. As a reader, you wish to read the original work in the language it was thought it, felt it and experienced in by the writer. There is always this sense of dissatisfaction at some point that manifests itself as a perception while reading a translated work. 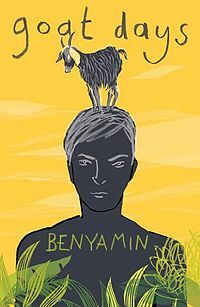 It happens to me a lot and happened again while I was reading “Goat Days” by Benyamin (born Benny Daniel), which is translated (and very well at that) by Dr. Joseph Koyippally. “Goat Days” is set in Riyadh, Saudi Arabia. The protagonist Najib Muhammad is a young man from Kerala who is recently married and dreams of a better life. He wants more, just like anyone else. His idea of success: Working in any of the Persian Gulf States. The minute he lands, he is taken away by a rich Arab animal farm supervisor and there start his troubles. He is kept in isolation and has to take care of the goats – day in and day out. He is tortured, beaten and starved. Najib is away from any kind of human interaction, so much so that he actually starts believing that he is a goat as well. All he dreams of is his escape and that is at the core of the book. That in short is about the book. The writing, though translated is well-paced and intelligently done. At no point did I get bored of the book or put it away. I am also on the other hand a strong believer of translated fiction – only because I believe that readers in that way are exposed to better and good literature. Najib as a character is neither complex nor simple. He is somewhat in between. I loved portions of the book when he almost starts speaking with goats, thinking of himself as one of them, since he doesn’t know the language and cannot interact with anyone else. The pathos and humour that is achieved through the writing at the same time is highly commendable. I liked the structure and premise of the book. Dreams that do not get fulfilled only make you realize that there is something more which might be in the offing. I felt a part of Najib’s journey – his hopes to his oppression to his escape. The book is intelligent and humane. For me it was a great read. This entry was posted in Books, Fiction, indian fiction, Penguin Books, penguin india, Review and tagged Benyamin, Fiction, Goat Days, penguin india, translation on August 8, 2012 by thehungryreader. I’ve just read this – as you probably know, it’s been nominated for the MAN Asian Prize. I Googled it and found your revlew. I agree with you – a great, engrossing read. Once or twice I felt a bit of brevity might have been called for – I came out of it feeling like a rather accomplished goat-herd myself – but overall, yes, unusual and appealing. Thanks for finding it first!